Cazadora Canguro hombre Carhartt Nimbus verde talla L. Original. Nueva con etiquetas. Square label. - sideopening with zip. - pocketswith hidden zip. 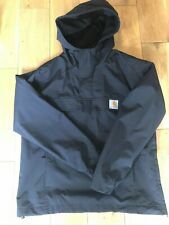 Carhartt Nimbus Pullover Jacket Navy Xl Vvgc. Condition is Used. Dispatched with eBay delivery – Shutl 1 day. Carhartt’s Nimbus Pullover (summer) has been constructed from a water-repellent nylon with a mesh lining. The jacket is styled with a half zip opening to the front, large pocket to the chest with side entry handwarmer pockets and elasticated cuffs. A zip is positioned to the side hem to allow for easy access and a comfortable fit. 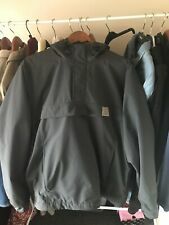 100% Nylon Nylon mesh Lining Half Zip Opening Front Pocket Drawstring Hood Zipped Handwarmer Pockets Worn a handful of times.